When I was a kid, here in Finland they already separated the paper trash, and later the organic garbabe. This was maybe 15 or 20 years before it was done in Mallorca, where I grew up. Many people still don’t want to “waste their time” with such things in Spain. This is very different in northern countries. Recently I was surprised to see a sticker in one of our garbage cans in Berlin, saying that “someone threw something wrong in this container. we will not take the trash away until you fix this”. If this happened in Spain the container would probably sit there full until the sun melted the container and the content away :) Here in Soukka, until one year ago, there was a small wooden house with several trash containers inside. 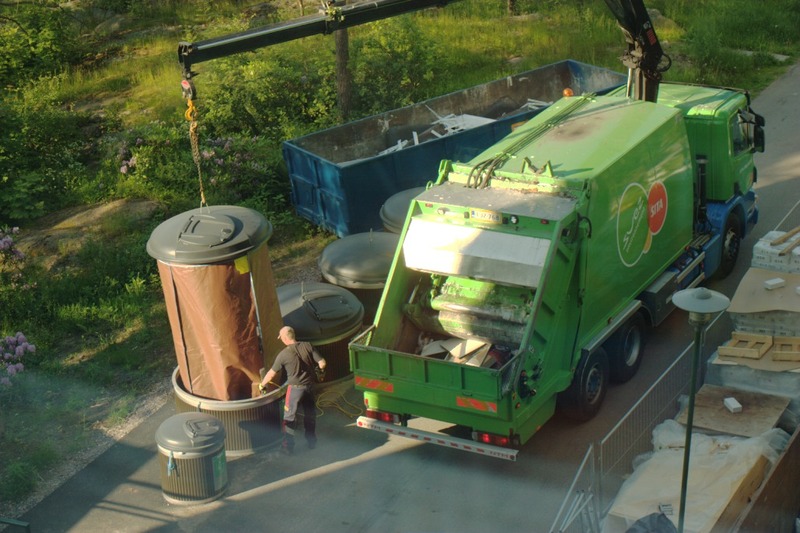 A different truck would come to pick up each type of garbage (paper, white glass, colored glass, organic, carton, plastic, or others). This wooden house has now been replaced by several containers that are mostly buried in the ground, probably about 5 or 6 meters deep. You use your house key to open each container and throw away your garbage. The garbage falls into a gigantic and very strong bag. Once a week, a truck with just one person comes, lifts the huge bag with an hydraulic arm, pulls from a rope in the lower end of the bag, and the content drops inside the truck. In the photo you can see half of the bag. I’m not yet sure of what benefits this system has, but I will find out. One other interesting thing that came to my mind, is that the 10 floor building where I stay does not have any kind of communicator to let a visitor ring a neighbor, or to let someone open the building door from upstairs. During the day you can just enter the building and ring directly someone’s door. But after 8pm or during weekends, the building door is locked automatically, and you can only enter if you have the key. Do people never receive visits from friends after 8pm or during weekends? If they do, they have to go down and unlock the door. Now that people have cellphones you can just ring your friend upstairs, but this system has been there for 20 or 30 years. I think people don’t have so many visitors around here :) Today I ordered a tiny video camera, so hopefully next week I can show you how beautiful Soukka is.